Are you ready for Cinco de Mayo? Do you have your tree up and decorated? It’s not too late! 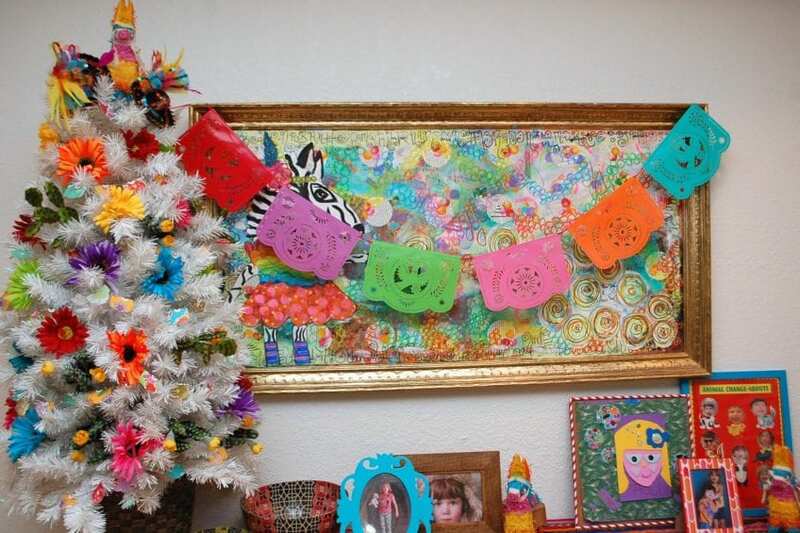 I’ve got two different options: Cinco de Mayo Tree and Feliz Navidad Tree – both styles could work. 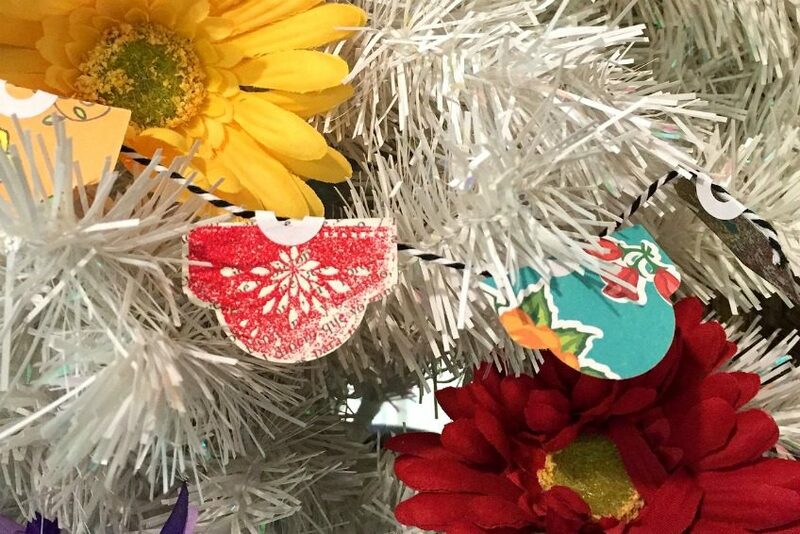 What makes this tree so fun is the mini papel picado banner I made as a garland. 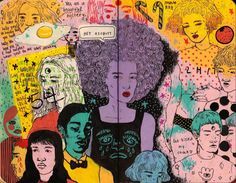 What is papel picado you ask? Read on. Papel Picado is a gorgeous and intricate Mexican folk art that means perforated or pecked paper. Usually displayed as banners colorful paper is cut with intricate designs like flowers and birds. 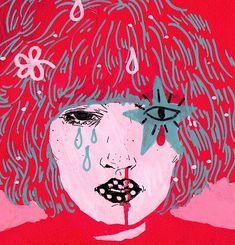 When I discovered there was a stamp and die cut I could use as a short cut for this mini version I was in! Please note that some of these companies sent me these items for free, but all crafty opinions are my own. Run your paper through the die cutting machine using the papel picado shapes. 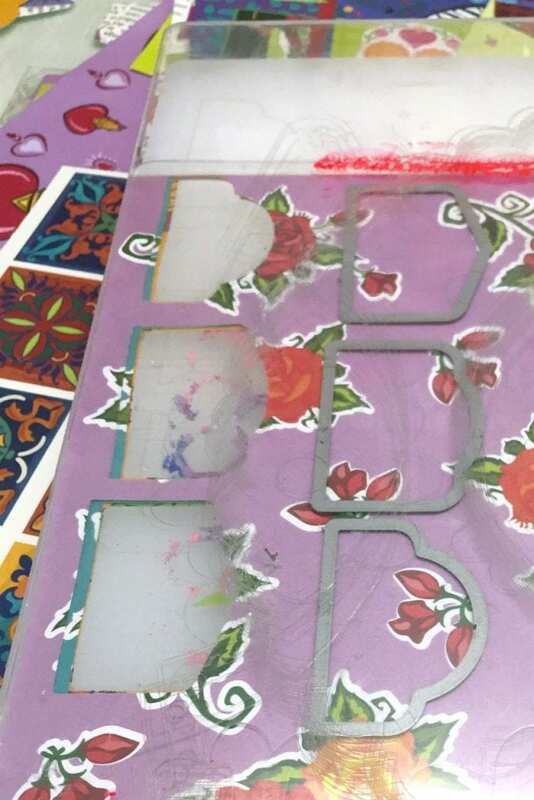 These stamps and dies are small so your banner will be too. 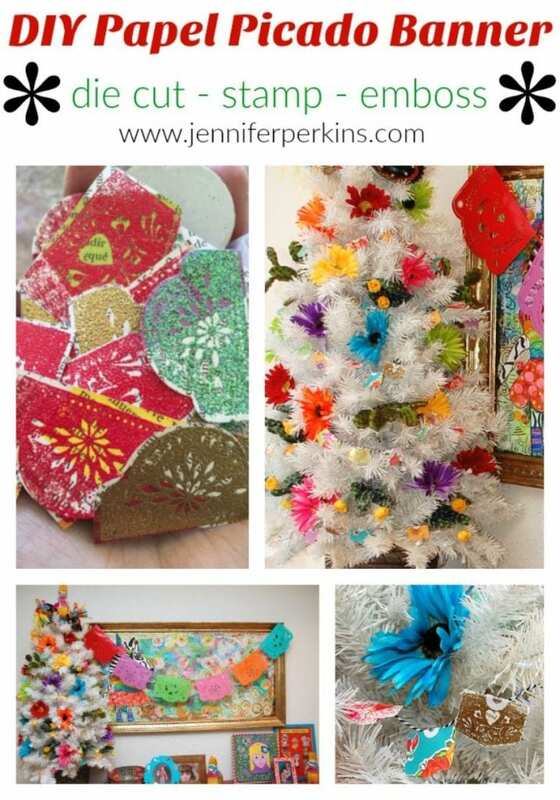 Typically for card making and scrapbooking, but I thought Cinco de Mayo tree. 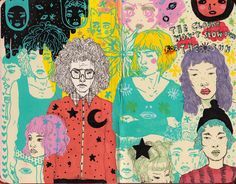 Make several in different types of paper. 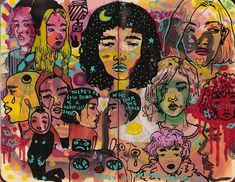 Again I used this colorful paper designed by my friend Kathy Cano Murillo of Crafty Chica fame. 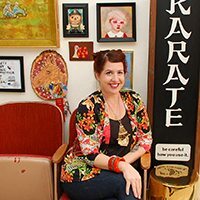 She has an entire new line of stamps and dies with Sizzix I can’t wait to check out this fall come Dia de los Muertos. Place your stamp on an acrylic stamp block. 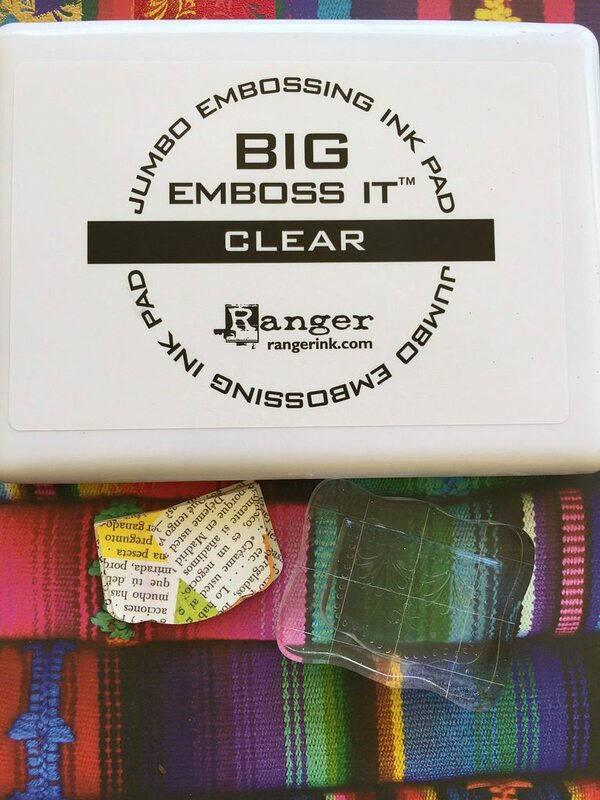 On a flat surface ink your stamp with embossing ink. Stamp onto die cut banner piece. While the embossing powder is still wet coat with embossing powder in the color of your choice. Shake off excess and return to container. Lightly go over the stamp with an embossing gun to melt the powder and set it in place. Once the paper banner pieces have cooled add them to strands of bakers twine using hole reinforcers. All that is left to do is display you banner. 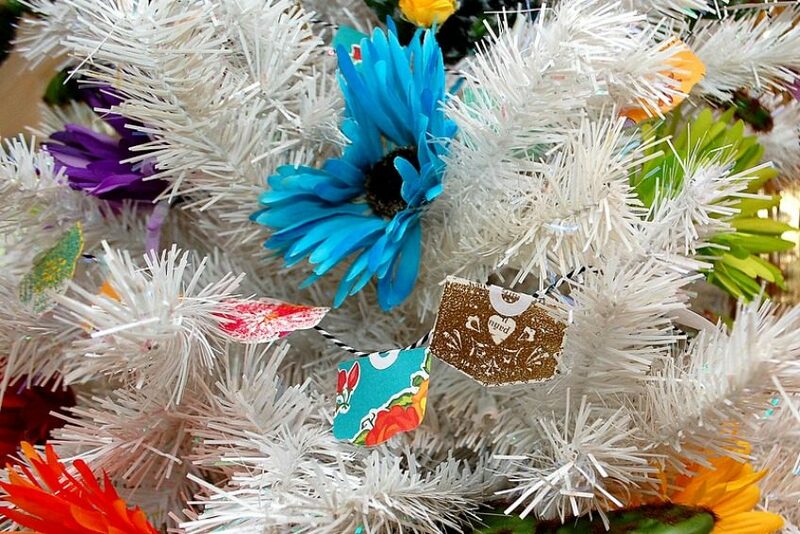 Hang it on a Cinco de Mayo tree, put it on a card or string it on a wall. I’m always amazed when I play with embossing powders about how cool that stuff is. 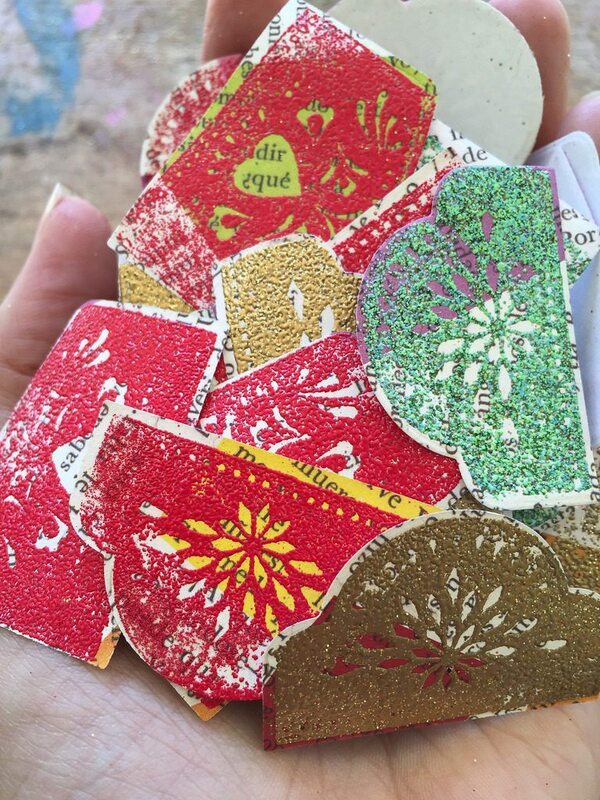 Throw in some festive papers and stamps and it’s even better! Want some more Cinco de Mayo inspiration. Read On! 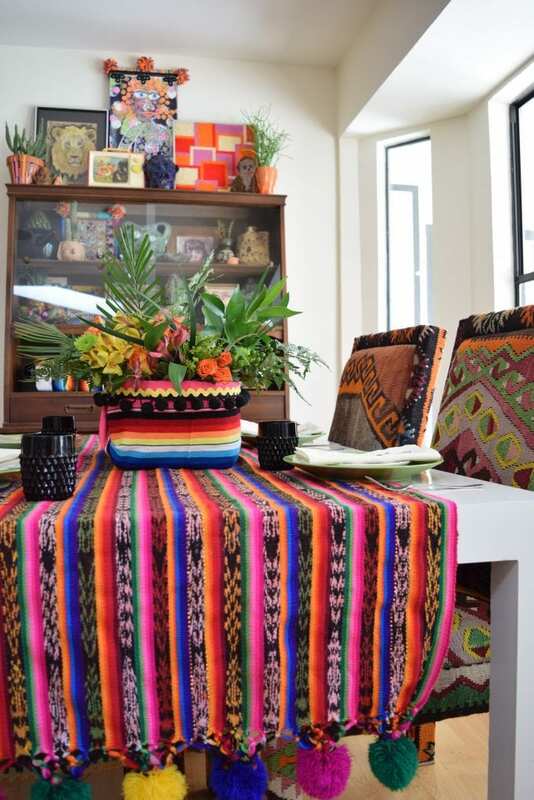 Serape Covered Basket Centerpiece – Looking for a festive way to spice up your fiesta? Over on DIY Network I have 10 Ways to Upcycle a Basket (including this one). 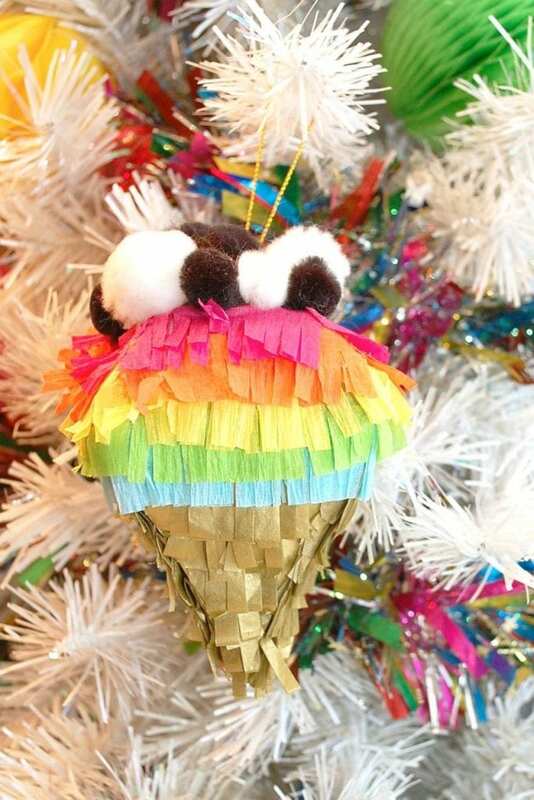 Piñata Ornament – Is the Papel Picado Banner just not quite enough for your Cinco de Mayo tree? 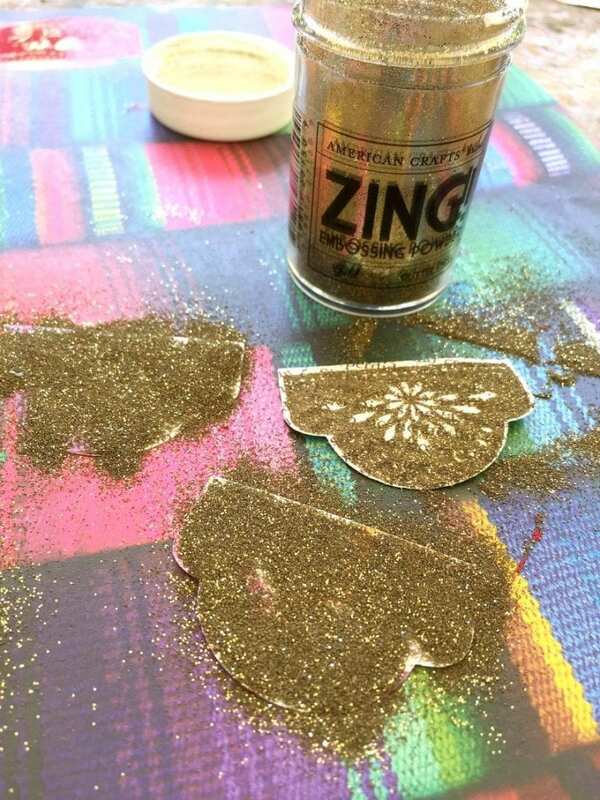 Go ahead and add some DIY piñata ornaments too. 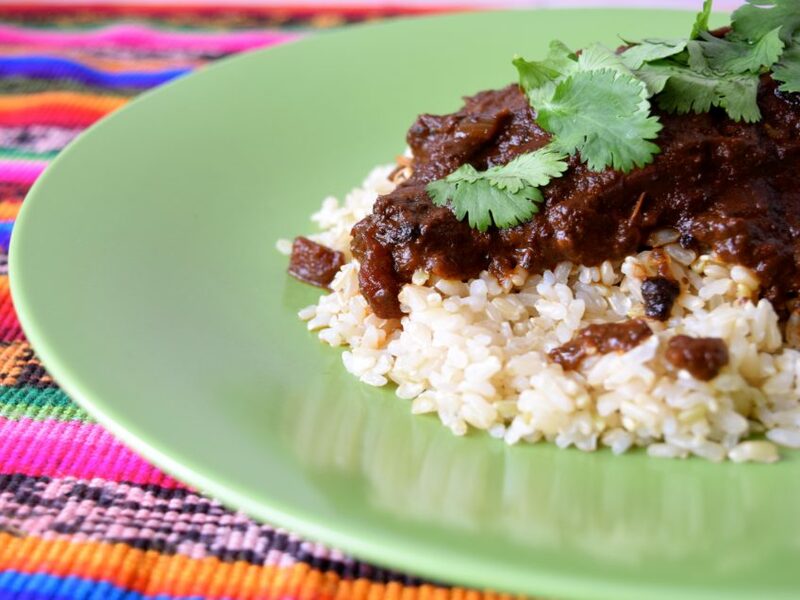 Peanut Free Chicken Mole – I’ve got a little with food allergies so I’m always looking for ways to take the peanuts out of my favorite recipes. I’ve got more 10 Delicious Peanut-Free Recipes. Posted May 2, 2017 & filed under Cinco de Mayo, Crafts, Holidays, Paper Crafts. 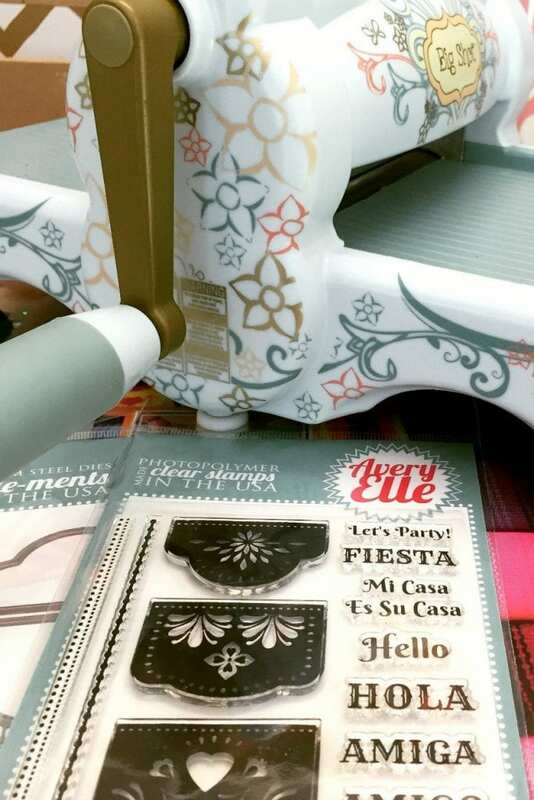 Very Clever making your banner with the die cut machine! I recently made a birthday banner for my daughter and it took me forever to cut out argh! Next time I’m using the die cutting machine too and that way I can make them more intricate and delicate too! Thanks for the inspiration!